The federal government has delivered a boost to the supply of social and affordable housing with a $6 million investment in The Big Issues’ Homes for Homes initiative. 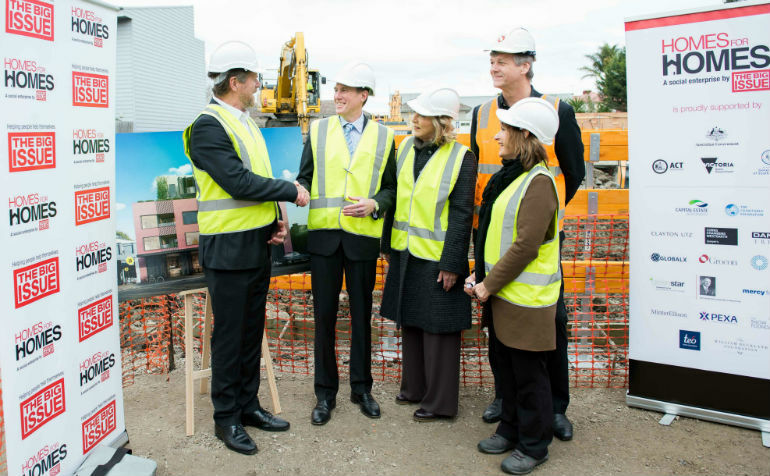 Construction company Grocon is partnering with the social enterprise through a 75-apartment complex development in Melbourne’s north-east. The Big Issue’s Homes for Homes initiative emerged in the ACT in August 2016. Homes for Homes is based on a US model developed by one of America’s leading homebuilders, Lennar Corporation, which the organisation tailored to the Australian market. Minister Porter said the partnership was a great example of the Homes for Homes initiative, which aimed to raise $2.4 billion to increase the supply of affordable housing. “Under the voluntary scheme, homeowners and organisations involved in property transactions donate 0.1 per cent of each sale to Homes for Homes when a property is sold,” Porter said. “Under this initiative, individual homeowners or national property developers are helping those who don’t have a roof over their head. “Over the long term these donations, which is just $500 on a $500,000 property, will generate a significant pool of funding to be provided through Homes for Homes to community housing providers to build more social and affordable houses. Porter said the government’s $6 million funding for Homes for Homes was intended to give the organisation the capacity to build on its early successes by developing its organisational capabilities and helping it achieve its aims. “This is the government, the community sector and businesses working together to help ease the shortage of affordable and social housing,” Porter said. Homes for Homes chair Sonya Clancy said participating property developers had a pipeline of more than 10,000 properties already committed to the scheme. “We expect to raise $2.4 billion for Homes for Homes over 30 years,” she said. Porter said developing alternative sources of capital for social and affordable housing was critical to helping Australians who are homeless or who are unable to access safe and secure housing. “Homes for Homes is doing this by tapping into private sector capital to generate funding for new affordable and social housing and should be congratulated for its innovative approach to help address this important social issue,” he said.